Osprey Capital Partners Inc. is pleased to announce that Place-Crete Systems LP (“Place-Crete”), a 75% subsidiary of Mosaic Capital Corp., has successfully completed the acquisition of the business being carried on by Associated Asbestos Abatement Ltd. (“Associated Asbestos”). Based in Saskatchewan, Associated Asbestos is involved in the remediation of asbestos, mold and other related substances in Regina and surrounding areas. 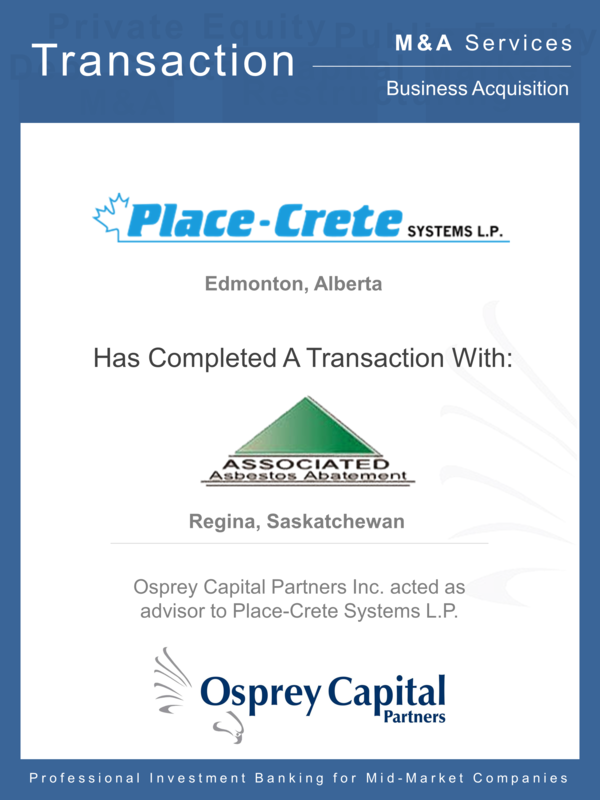 Associated Asbestos will provide Place-Crete with additional exposure to the growing Saskatchewan market. Place-Crete Systems is a full service specialty contracting firm that focuses on concrete restoration work, traffic deck membranes, gypsum floor underlayments, hydrodemolition services, plaza and bridge deck waterproofing, polymer floor and wall systems and various other specialty contracting services. Place-Crete has been in the business of supplying construction services throughout Western Canada since 1984 and currently maintains offices with experienced staff in Edmonton, Calgary and Abbotsford, British Columbia. Osprey Capital was engaged to assist Place-Crete in identifying acquisitions that would enable it to further capitalize on the growing demand for its services in central Canada. “The outcome this successful acquisition mandate created for Place-Crete and Associated Asbestos is important and we look forward to their continued growth in the marketplace.” said John Mottola, Managing Partner of Osprey Capital.